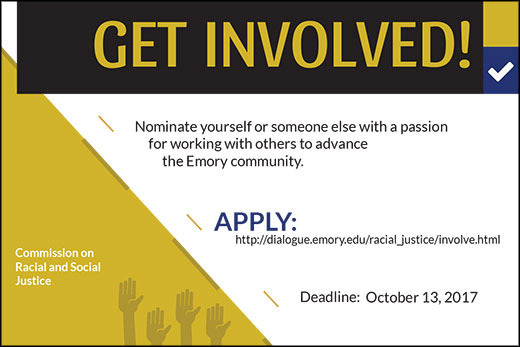 As the Emory Commission on Racial and Social Justice (CRSJ) moves into its second year with some major accomplishments to its credit and other significant changes in sight, the body is inviting student applications and faculty nominations to fill the positions of several members whose terms have expired. The deadline is Oct. 13. Emory student Chelsea Jackson acknowledges that, when she was invited in 2016 to join the university’s then-newly created CRSJ, she experienced some misgivings. “I did have concerns about ‘selling out’ and becoming a part of the bureaucracy that has been an obstacle for student activism and progress at Emory,” says Jackson, a senior in the BA/MA program in political science. “I overcame that fear by counting on my fellow student activists and my mentors to keep me honest and prevent me from getting burnt out,” adds the 2017 Truman Scholar, who joined the commission as a working group member and now serves as a CRSJ communications intern and member of the CRSJ Executive Committee. Since then, Jackson has encouraged other students who share her passion for racial and social justice to consider applying for membership on the commission. Responding to the 13 demands set forth by the Black Students of Emory movement in fall 2015 and building on the work of Emory’s first annual Racial Justice Retreat in spring 2016, the CRSJ was created the following summer by the Office of the President. This fall, undergraduate, graduate and professional students are invited to apply to join CRSJ working groups, which also include staff and faculty. Working groups address specific racial and social justice issues, such as inclusive teaching, student organization funding and community building. Faculty may nominate themselves or faculty colleagues to the CRSJ Steering Committee. Staff may nominate faculty to the same body. The steering committee also includes students, staff and alumni as well as representatives from student, faculty and staff organizations. According to Yarbrough, change has been implemented or is being explored in a range of areas. These include bias reporting, student organization funding, student mental health, open expression policies, faculty recruitment and faculty evaluation. “All of these issues are vital to a more racially and socially just university community as we move from diversity to inclusion,” she says. "CRSJ relies on student, staff, alumni and faculty involvement to make concrete positive change." Jackson agrees that meaningful progress has been achieved to date on several of the original 13 demands. For more information, visit the Campus Life Dialogue at Emory website. To submit a student application or nominate a faculty member, simply click here and complete the form before the Oct. 13 deadline.